Tom, while better goaltending and Tarasenko getting hot are two of the most obvious reasons the Note are playing better, what in your opinion is one of the more underrated reasons behind this turnaround? If it's simply a matter of better chemistry, what changed in the formula between Yeo's dismissal and this impressive run to make such a reversal possible? I don't know if it's under-rated, but the team's defensive play has jumped up. It is the five-man unit that teams live to see. Early on, you'd see defensemen pinch forward, the puck go the other way, and whoever was in goal was facing an odd-man rush. You don't see anywhere near the number of odd-man rushes you used to see. There defensive coverage is much better. Also, they've gotten much better at keeping the puck in the offensive zone. One of the best ways to play defense is to have the puck 200 feet away from your net. That has helped them to wear down defenses more. And, again, the team's confidence has skyrocketed. They can weather storms much better than they have in the past. I guess as long as we don’t lose our next 8 games before the trade deadline it appears we will be buyers this year. If we are indeed buyers who else it out there we could grab that isn’t a RENTAL? No rentals please!! I was rather impressed with Kyle Palmieri from the Devils last night. Would Palmieri be a good fit and if so what would it take to get him do you think? BTW, I really like this MacEachern kid. I hope Army doesn’t screw around and start shuttling him back and forth to San Antonio. What’s up with Fabbri? I think I answered this question without actually posting it. Now, my answer may make more sense. Something more has to be going on with Fabbri! With back to back games and then playing New Jersey last night you would have thought he would have gotten into one of the last two games. Management even alluded to this while speaking to the press within the past week. Reading into this I have to assume Fabbri isn't 100%. Is he participating in full contact practice? We've heard over the past couple of weeks that he made a couple of poor decisions with the puck and caused a few turnovers. But at this point of the season hasn't every player had a couple of turnovers? Fabbri has been a regular in practice and in contact. He hasn't been held out of anything that I've been able to see and they certainly played him when he first came back from his injury. But while he may be 100 percent physically, he seemed hesitant on the ice. The most noticeable stat was that when he came back, he wasn't being credited with any hits. While Fabbri is a guy who doesn't have a lot in that category, he went from having one or two a game to having none. He had one hit in the eight games he played after his shoulder injury. That speaks to a hesitancy in his game. Berube has said that's what got him out of the lineup and while they want to get him in, until the Blues or someone gets hurt (or Perron comes back) the gameday lineup isn't changing. Hey TT...thanks for the chat! Last week you mentioned you were a writer in LA at one time. I was a transplant there in the early to mid 90's. I remained a STL sports fan, but did enjoy the Kings with Gretzky, Blake, Kurri, Taylor, Robitaille, McSorley, et al. What sports did you cover? Were you there at that time? If so, my apologies for not remembering. However, if I do remember correctly, Helene Elliot covered the Kings for the LA Times...is that right? I assume she has a lot of respect among your peers too? Between 1985 and 1996, when I moved to St. Louis, I covered, at various times, UCLA basketball, USC football and basketball, and, very briefly, the Clippers as full time beats at the Daily News and the Herald Examiner. (The paper I was at when I was covering the Clippers, the Her-Ex, closed a week before the season began.) And I helped out on the hockey beat. At the Daily News, I was also the assistant/deputy sports editor for three years. Helene wasn't doing the Kings when I was doing them, but she is very well respected in the hockey community. She's in the Hockey Hall of Fame. How does the game-night atmosphere at Enterprise compare to other rinks you've visited? Noise level, music and promos, concessions and all that. Any observations? There are a lot of places with much splashier presentations. Vegas is renowned for its pregame routines and Nashville doesn't do on-ice contests between periods. They just introduce a band that performs from a stage on one end of the rink. I've seen some spectacular video presentations projected on the ice in places like Montreal. Noise can be hard to compare from place to place, though I remember being at a game in Anaheim once where Doug Weight got hit, I forget if it was by a puck or a stick, in the face and it was so quiet you could hear him swear at the very top of the arena. Doug, being Doug, was embarrassed to hear that when I told him after the game and apologized profusely. The Blues seem to do things like throw pies in the faces of "fans" of "other teams" more than any other team in the league. You may, by the way, have noticed the promo on this page for our sale on a digital subscription. It's really worth it. Hi Tom- I didn't get to see the post-game interview with Petro last night, but I heard a few people mention he seemed annoyed or frustrated, and then ignored the fans on the way back to the locker room. Seems like odd behavior after your 7th straight win - an 8 to 3 one at that. Any thoughts? I didn't see that, but then, I was in an elevator and in a corridor under the stands after the game. He seemed in a jovial mood when he spoke to us in the dressing room after the game. This is another topic we were discussing today. I tend to doubt Bouwmeester will come back. Gunnarsson, with his injuries this season, would seem to have a tough go of it on the free agent market after this season. He'll be 33 at the start of next season and is hitting that point where teams are more inclined to play younger, cheaper players. Would this drive down Gunnarsson's price that the Blues could make a minimal investment in him? Maybe, but it's more likely that the team would say, we've got these young defenseman backed up in San Antonio, like Reinke and Walman, it's time to give them a chance. So what's the deal with Fabbri? Is it conditioning related, lack of confidence that he won't get reinjured? Combination of both? Have we seen the last of him in a Blues jersey? I don't think we've seen the last of Fabbri. When he has been healthy in previous seasons, he's shown he can play at this level and his price is still very reasonable, especially since he's not going to get much of a raise after this season. He's a valuable commodity and he's still young. (He's younger than MacEachern, for instance, and only five months older than Sammy Blais.) Going into this season, it was hard to figure what the Blues would get out of him as he returned from two knee surgeries, and then when you throw a shoulder injury in, that's a lot to deal with. If he's fully healthy and fully confident, he can be a contributor. It just may take until next season. While Binnington has been pretty solid. Let's not appoint him the savior. Not to jinx him, but what happens when all these shots that keep beating him. Ten or more posts or crossbars in his few starts, quit clanking off the post and start going in.Just saying he hasn't been some brick wall back there. It does seem that teams hit a lot more posts and crossbars with Binnington in goal. I've been meaning to go back and count it up to see if the reality matches that. It's said, in the defense of goalies, that players hit posts because they have nothing else to aim at. But I agree that it's too early to say Binnington is the answer to all your goalie issues. I would say that about any goalie who's made 12 starts and isn't named Brodeur, Roy or Dryden. But he's certainly giving the Blues something to think about, and the Blues could be looking at a 1A, 1B situation next season. And Ville Husso, who the Blues have been higher on from the start, still lurks out there. I saw the Bob Costas story on NFL concussions. Shouldn’t the NHL be worried about future lawsuits? Tom - thanks for taking our questions. I was curious if you have had an opportunity to speak with scouts or analytical experts about Binnington and his perceived upside? Has his success at this level been completely unexpected? And what do they see as his long term upside? I have not spoken to scouts about Binnington. The analytics say that the Blues defense has played very well in front of him and limited the quality of shots he's faced. The eye test says he hasn't given up many soft goals. Was this unexpected? Binnington played very well in the minors this season and last, which led to the Blues shipping out Chad Johnson and promoting Binnington, but once Binnington got to the NHL, as I said earlier, there was no great rush to play him and the Blues were content to have Allen play every game for as long as he could. So while it was not completely unexpected, I think the Blues weren't expecting him to play like this. Though, when you consider what his numbers have been like since he was called up, there aren't a whole lot of goalies you would expect to play like that. It's safe to say no one in the organization was saying, "Once we get Binnington in goal, he'll go 10-1-1, have a save percentage under 2 and we'll win seven in a row." i like this berube guy. good nickname. lots of pims when he played. if the blues hang on and make the playoffs, i don't know who outside of q i would take over the chief. When Berube first took over, the Blues penalties seemed to go way up. There was one three-game stretch where the opponents had 19 power plays. The number of penalties has come down significantly. Don't know if it was you Tom or JT. But there was a conversation a few weeks ago about the blues record. We are now over 500 any which way you look at it. The Blues are 28-22-5, so even if you call those OT losses losses, they're above .500. Which is no small feat. Believe me, I hear you. We do have two writers committed to the Blues on a daily basis, and Jim and I try to crank out as much stuff and provide as much information as we can. But since analytics are the order of the day, I'll say that any Cardinals story gets way more readers than any Blues story, and I'm sure that goes for TV ratings as well. It's just how St. Louis is. Still, the beauty of the webpage is you can go straight to our hockey coverage if you'd like. Wasn’t a moment in the season where you thought the Blues might get past the first round of the season in when Tarasenko scored after Nashville tied it 3-3 and in OT? There was so much pressure from the screaming fans and our goaltender looked shaky. I might go for the win at Tampa Bay. The Lightning are the elite of the league and the Blues shut them down. But that Nashville game reinforced that belief, especially since any playoff run for the Blues would likely go through Nashville. Similar to my prior question, the Blues appear to have more depth including on D than they have had in years past. The D has two UFA’s and Jordan schmaltz is unlikely to be a long-term asset, but it seems hard to imagine the team trading either Jaybo or Gunnerson before any potential playoff run. Do you think the team looks internally to fill the two UFA slots? It sounds like 2 of the 3 Dmen in San Antonio, the big Finnish player, Reinke and maybe Walman, are shots next year to make the team. If Mikolos (sp) could make the jump between him, Parrayko, Edmunson, and Bortozo the Blues would have a physically imposing set of players most with very long arms and strides. Yeah, I didn't even mention Mikkola when I talked about the D in the pipeline. There's a hockey axiom that you can never have too many defensemen -- Larry Pleau must have said that on a weekly basis back in the day -- and the Blues seem to have plenty there. Schmaltz may get lost in the shuffle there with younger, shinier models coming up. I think with guys like Mikkola, Reinke and Walman still playing at very affordable prices, I think they'll get first chances for the Blues to fill those openings next season. It was so surprising to see how bad the Blues team, with essentially last year’s D core, was early in the season. Blown coverages, odd man rushes, vacant net front presence, all from veterans who had been in the same system. The forwards got tossed with additions and subtractions, but the D core was virtually the same. Have you been able to piece together why the fit was so bad early in the season? There were several factors. Bouwmeester probably shouldn't have been playing at the start of the season. He may have been recovered from his injury, but he wasn't totally back. His play at the start of the season wasn't up to what was needed from him. Now, he's totally back and is playing some very good hockey. But it doesn't all fall on the defensemen. The forwards weren't doing their jobs, they weren't providing coverage when a defenseman went forward, which is something the team wants them to do. That was part of the reason for all the odd-man rushes. The defensemen would go forward, but so did the forwards, and when the puck turned over, it was see you later. That may have been the result of the wholesale changes at forward, which also may have caused all of them to think, with all these guys who can score, I better go forward to and get mine. As many players have said, earlier in the season, there were a lot of guys playing for themselves and now they're playing as a team. I had tweeted at some point in the midst of all that that it looked like Schwartz would never score in my lifetime. I've been proved wrong. Next up is to see if, having scored, this unleashes Schwartz and he scores on a more regular basis. He's had so many chances and such bad luck that numbers say he should start going back toward the mean. We'll see. And wouldn't that open net miss have been painful if Nashville had come back to tie the game? Any more news on Patrick Berglund's whereabouts or what exactly caused his meltdown? Or did I miss this story? You must have missed it. He didn't like Buffalo. 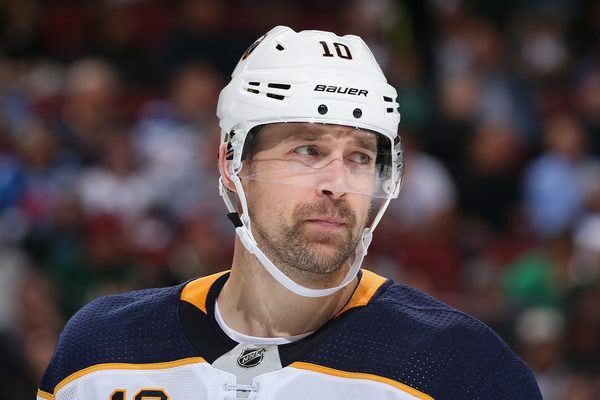 Here's a story from the Buffalo News on an interview he did with a Swedish paper in his hometown. I find the tweets from you pointing to analytics are interesting, it seems as though this has become more accepted by the sports writing community. It seems like the Blues have a positive situation of almost having too many bodies up front, Perron and Fabbri are out and Thomas is slotted lower than he would otherwise be used. Do you think Army rolls with the depth, turns two players into a shinny new one, looks for picks? Next year presumably the Blues will bring up Kyrou and possibly Blais with no loss expected form the top four lines. It would appear that Army will need to make a move at some point before or after a potential playoff run.